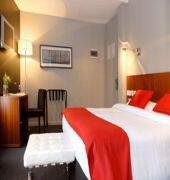 Established in 2007, this is a modern city hotel where guests will feel at home. It is ideal for business travellers and holidaymakers alike and comprises a total of 45 rooms decorated in minimalist and sophisticated style. Facilities on offer to guests at this air-conditioned establishment include a lobby area with a 24-hour reception and check-out service, a hotel safe, a currency exchange facility, a cloakroom and lift access. 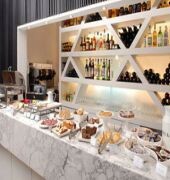 It also offers a cafe, a bar, a restaurant and WLAN/Internet access. Guests may take advantage of the room and laundry services.The rooms come with a private bathroom with a bathtub and a hairdryer as well as a telephone with national and international direct dial calling, cable TV, a minibar and Internet access. They are also equipped with a double bed, individually adjustable cold/ warm air conditioning and a digital safe. 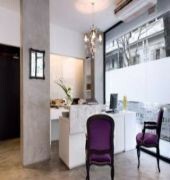 All rooms also feature either a balcony or a terrace.This hotel is located in the most charming district of Argentina's capital, in the neighbourhood of Recoleta, one of the city's most elegant areas which is bursting with cultural heritage. Close by guests will find the Bellas Artes Museum and the Palermo Gardens and the nearest links to the public transport network are 500 m away (Aguero railway station). 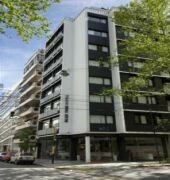 The shopping venues of Alto Palermo are 800 m away and it is 4 km to the Retiro ski region and 5 km to Plaza de Mayo. Aeroparque Jorge Newbery Airport is 3 km away.